As the pretentious man in the informative video on teenagers we watched in Year 7 will tell you: “Teen emotions are a rollercoaster”. My thoughts at the time were something like ‘Uh huh. I am definitely believing you right now, pretentious man making faux sympathetic faces and pretending to know what it is like. Your word is the law.’ I think now that it actually wasn’t a terrible analogy, though. I have no idea if it gets better or worse as you move into the ages that *gasps* start with a 2 (and a 3, and a 4, etc.) but it feels quite apt for me. I’m a complete yo-yo when it comes to feelings. One small thing can set off a crazy living nightmare sequence that hurts whenever I think about it. And one small thing can make me impossibly and indescribably happy. We’re supposed to be the internet generation. The ones with the concentration of a goldfish who can’t do anything except take selfies and whine about homework. I think we’ve definitely grown up in a different environment to our parents, sure, but it doesn’t feel all doom and gloom to me? I feel so lucky to be alive right now to steal a line from a musical making me indescribably happy at this moment in time. There are definitely a lot of issues right now that weren’t as prominent a few decades ago, but I think we’re so much more well-equipped to deal with them. I FEEL HOPEFUL FOR THE FUTURE OF HUMANITY. 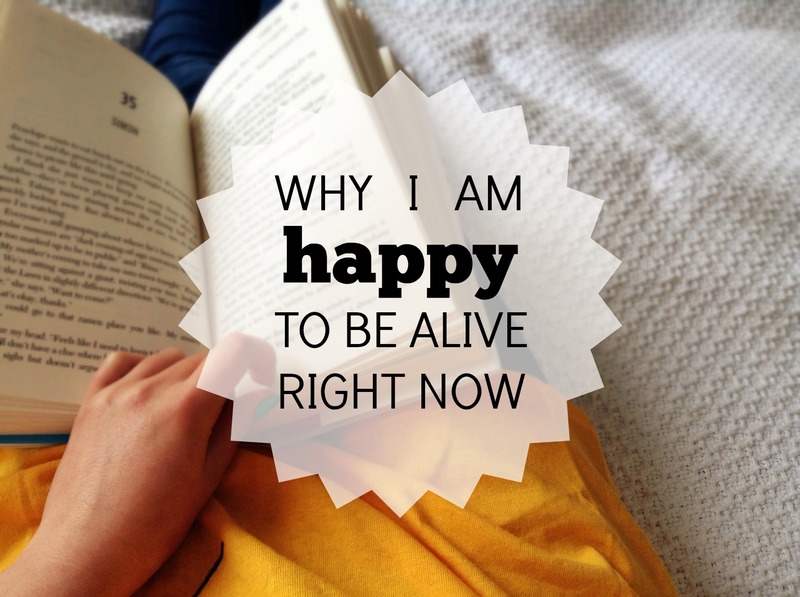 Sometimes, people tell me that I shouldn’t be relying so much on books for my happiness. I totally get that they’re not, like, living and breathing people you can talk to, but if they make me happy then…WHY NOT? It’s not hurting me, and it’s not hurting anyone else. (I mean, I might have slightly damaged my friend’s ears with screaming from Carry On. But that was only temporary.) When I’m feeling upset of anxious, I will honestly just sit down somewhere quiet and go listen to something like a podfic. The world feels a lot less terrible when ridiculous scenarios are being read into your ear. I am just very in love with people and books and the world. I’m so happy to be able to experience all the things I love. It can be hard to remember that, but when I do feel good — when I read writing so breathtaking that I maybe actually forget how to breathe, or I hear an fabulous song, or I have the loveliest conversation with someone — it seems like I couldn’t possibly think anything else. Next ›Should We Judge Books By Their Authors? Nawwwww, Eve! This post made me feel all lovely and squishy and nice! It was like reading a hug!